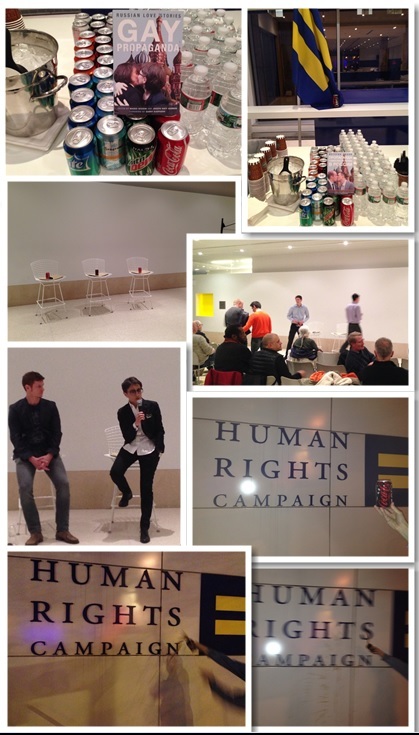 Tonight HRC hosted Russian activist Masha Gessen and still they serve Sochi sponsor Coke products. What did Shakespeare write? “All the Worlds a Stage”….last night, HRC Headquarters was a performance space, from an homage to Andy Warhol’s coke bottles to the HRC sign getting a coke bath. See Ty Cobb’s (HRC’s Director of Global Engagement) remove the coke can ‘installation’ prior to beginning the program. With finesse he turned the can horizontal, taking it out of view, only seconds before beginning the evening’s program, telling me that he knew something was wrong with it being there. Awareness is the first step toward action, right? I am – I swear Scott – a homofascist!